Greyt Greys Rescue is a volunteer run, non-profit group, which is dedicated to the rescue of ex-racing greyhounds. All of our greyhounds are fostered by volunteers in a home environment, to better prepare them for life in their forever home. Step 1 - Email us at adoptions@greytgreys.org to express interest in the hound that you are looking at. If you would like more information about the dog, please call us on 0421 929-062. If we cannot take your call immediately, please leave a message and we will return your call as soon as we can. Step 2 - We will email you back an application form and await return of the form by email. All applications must be accompanied by an application form. Step 3 - We will contact you regarding a meet and greet (pending the suitability of your application). 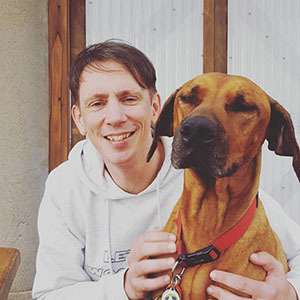 There may be situations where the hound that you are applying for, is not suitable to your home situation, but we might have another hound available that better suits your situation. We do not advertise our foster dogs immediately, as we give them time to settle into home life first, so we can better assess their temperament. We may have a hound in foster care who might be well suited to your family, that has not been advertised yet. Step 4 - The meet and greet will be organised so that any other pets in your family are also present. This would preferably be done in your home, as a home check can be done to ensure that adequate fencing, shelter, etc will be provided to the hound. The adoption fee of $270 needs to be paid before the hound is adopted. Step 5 - You take your new family member home on a 2 week trial. If you have any issues, we urge you to contact us to try and work through them, as all dogs will have some period of adjustment. If, after the 2 week trial, you feel that you need to return the dog, we will refund your adoption fee (less a $50 administration fee), upon return of the dog and all paperwork and other items that the dog was adopted with. 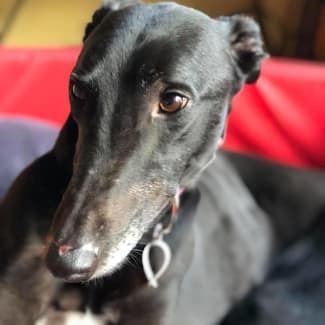 Eve is an amazingly sweet, affectionate and happy 5 year old girl. 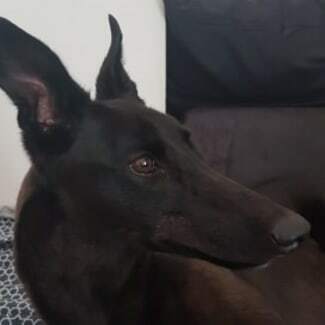 She thrives on companionship with humans and her greyhound foster sister. She is very self-assured, interactive and confident. Rarely, have we seen a greyhound adapt to home life so quickly. She is just lovely! Eve is fine around other dogs of a medium to large size. She is great with children, and has been very gentle with her young human foster brother. She is a very social girl, so needs to have another dog for company. Eve is de-sexed, heartworm tested, wormed and vaccinated. She walks very well on a lead. If you would like to know more about adopting Eve, please phone the number below or click “enquire about this Pet”. Cuddles is a 4 year old boy whose name says it all. Cuddles by name, Cuddles by nature! He is a slightly bigger boy at around 39kg. He thinks he is a super agile cat sometimes. He obviously did not get the memo that says he is actually a Greyhound! Cuddles is extremely affectionate and a real smoocher. He adores playing with his toys. If you are looking for an interactive, affectionate and sweet addition to your family, you need look no further. This is the boy for you! Cuddles is very easy going and gets on well with medium to large dogs. No small dogs or cats please. Cuddles could be an only dog and does not seem stressed when on his own, however like most dogs, would rather not be home alone for too long every day. Whilst he is a gentle boy, due to his size, he is not suitable in a home with very young children. Cuddles is de-sexed, wormed, heartworm treated and vaccinated. He walks well on a lead. If you would like to know more about adopting Cuddles, please phone the number below or click “enquire about this Pet”. Safford (or Saffy, as he is affectionately known) is a loyal, loving, cheeky and playful four year old boy. He is quite lively and usually runs rather than walks into or out of the house. That is his nature! 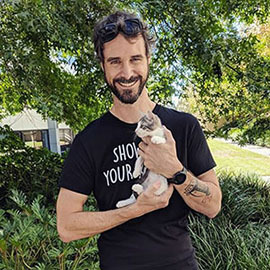 He had his challenges before coming to Greyt Greys, but is really thriving in foster care. He is now ready for his forever home. Saffy just wants to be loved. He understands basic commands, responds well to training, walks well on lead and loves an ear rub. Saffy enjoys doing zoomies and playing with his squeaky toys. He loves a slow short walk and long lazy snoozes. He enjoys having his own personal space and will love having a special dog bed all to himself. He also needs a home where someone is home often, or is able to take him to work. He much prefers to have the company of his trusted human family. He will struggle on his own for long periods. Saffy is best suited to an adults only home, or one where the children are much older. He is fine around smaller dogs, but no cats please. Saffy can be a “slow to warm up to you” kind of boy, however when his trust is gained, you can expect a happy, fun and loving companion. The rewards will be worth your patience, as he is truly a beautiful soul. Saffy is best suited a home with experienced dog owners, who can be patient as he settles in. Saffy is house trained, de-sexed, wormed, and vaccinated. He did not race. If you would like to know more about adopting Safford, please phone the number below or click “enquire about this Pet”. Billy is a 5 year old all round sweet boy. He is a little on the small side for a boy, but that just makes him even sweeter! He loves a cuddle and loves his toys with a passion. His foster carer reports that Billy is a “big ol’ shadow dog”, who loves being close to her. He is a “couch natural” and can entertain himself by collecting and accumulating things in his bed. He does not chew anything though. Although playful, he can settle quickly when it’s quiet time. He loves meeting other dogs and can get excited when on walks, because everything is so AMAZING to him! Billy would like to have another dog for company. He could be an only dog, but ideally only where someone is home often. Billy is de-sexed, wormed, and vaccinated and toilet trained. He walks well on a lead. He is great around other dogs of medium to large size and does not have a mean bone in his body. No small dogs or cats please. 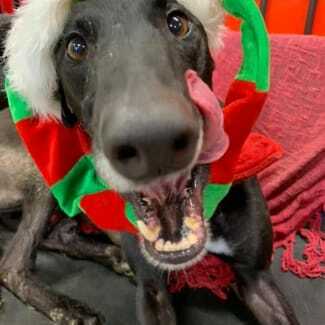 Billy is ready for his special family. He will become loyally devoted to them in no time! If you would like to know more about adopting Billy, please phone the number below or click “enquire about this Pet”. 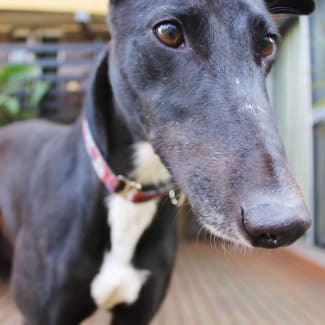 This affectionate, lovable and good natured girl has so much going for her at 5 years of age. Becky loves being in the company of her human family and is great with kids. Her favourite time of the day is walkie time. When the lead comes out, her tail wags madly and she dances around the room, hardly able to contain her excitement! In contrast, Becky also likes to curl up on her special blanket and snooze the hours away. Squeaky toys also keep Becky entertained as well as keeping her people fully occupied watching her have fun with them. 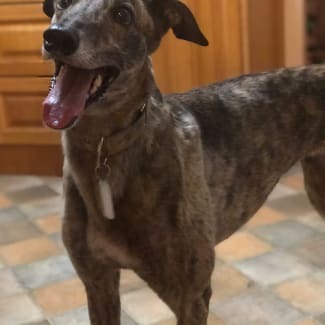 Becky is a playful, active Greyhound loving some outdoor time, whilst also very much appreciating the company of people. Having a continual stream of activity in the home would be ideal for Becky. Becky walks well on a lead and is good with dogs of medium to large size. No cats please. Becky is de-sexed, wormed, heart worm tested and vaccinated. If you would like to know more about adopting Becky, please phone the number below or click “enquire about this Pet”.